Considered by many to be the most prestigious awards in 4-H, the National 4-H Presidential Awards Winners – the top girl and the top boy in the Achievement, Citizenship and Leadership programs – began in 1924 with a single winner in the Leadership program… and ended after the naming of the winners for the year 1993 – a 70 year run. For many years the six top recipients were given silver trays in the name of the President of the United States. 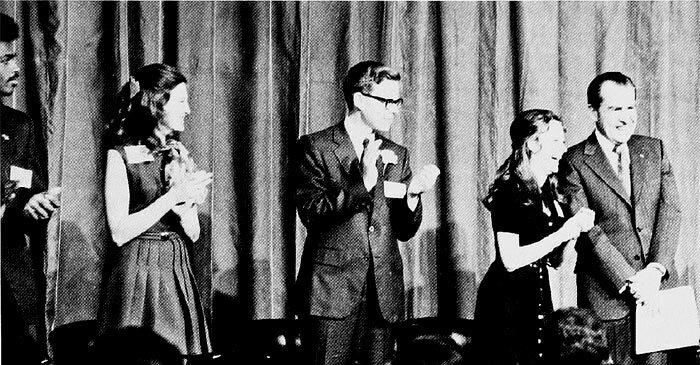 President Richard M. Nixon with winners of the National 4-H Presidential Awards at National 4-H Congress. Although the Presidential Winners program did not receive the year-round publicity that was generated by the National 4-H Report to the Nation Program, the naming of the winners at the closure of National 4-H Congress in Chicago each year generated much promotion and visibility for that one event. This entry was posted in History and tagged Presidential Winners by Larry Krug. Bookmark the permalink.